Congress has agreed on something: designating a National Museum and Library for George Marshall. Now it's the Senate's turn. This designation will help keep alive the memory of "one of the greatest leaders of the 20th Century," says the museum president, Ron Havers. "Yes, I said," replied McCullough. "And that’s where we started talking about the General who supervised the U.S. Army during World War II and later received the Nobel Prize as Secretary of State." We should not be surprised that young people are largely ignorant of one of the most important leaders who won the Second World War, since military history has been so rarely taught in schools and universities in recent years. But that's another topic. 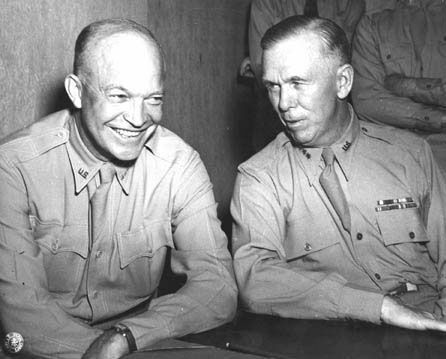 During World War II, Marshall (right) was responsible for choosing the seniors leaders such as Dwight Eisenhower. As a young Army officer, Marshall served on the headquarters staff of the American Expeditionary Forces during World War I. where he was a key planner of American operations including the Meuse-Argonne Offense. As Army Chief of Staff, Marshall organized the largest military expansion in U.S. history, choose the key leaders, and was promoted to five-star rank as General of the Army. The Marshall Plan allocated more than $13 billion in an effort to help post WW II Europe recover, an effort that was widely considered a great success. For his work in restoring European political and economic life, Marshall was awarded the Nobel Peace Prize in 1953; a recognition we feel was well deserved. Marshall received the Nobel Prize for his leadership in efforts to help Europe's economy recover and "so as to permit the emergence of political and social conditions in which free institutions can exist." Plans are now underway for the George C. Marshall Foundation in Lexington, Virginia to be officially designated as the George C. Marshall Museum and Library. A measure that was introduced by Congressman Bob Goodlatte [R-VA] for the designation passed in the House and now moves on to the Senate for their consideration. Passage marks a significant moment for the George C. Marshall Foundation. "This Congressional designation provides a de facto recognition of the role this institution has played in keeping alive the memory and the legacy of one of the greatest Americans of the twentieth century, General George C. Marshall," said President Rick Havers. 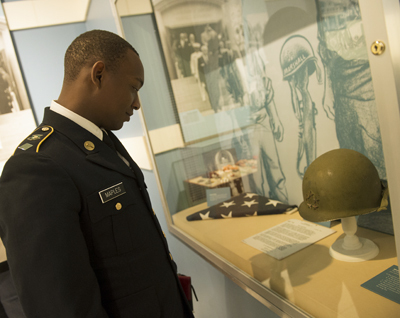 The Marshall Foundation in Lexington, VA offers exhibits and educational programs on the five-star general and also broader topics such as the contributions of women in World War II. The designation would further highlight the contributions of an extraordinary American. We can only hope that in the future we will again see the leadership and commitment of more people like Marshall. Hopefully the designation will help teach a new generation the importance of those qualities.